New leader: Brisbane archdiocese’s vicar for clergy Fr Michael McCarthy has been chosen as the next bishop of Rockhampton. ROCKHAMPTON’S new Bishop-elect Michael McCarthy was to concelebrate Mass on the feast day of St Joseph’s Cathedral’s patron saint last Wednesday. Rockhampton’s 10th bishop, who will be installed on the morning of Thursday, May 29, has a long connection with the diocese. The diocese’s administrator Fr John Grace spoke of his delight at the appointment as did former Bishop Brian Heenan. The 63-year-old Toowoomba-born priest formed a close friendship with Bishop Heenan and for many years has been concelebrant at the Mass of the Oils in St Joseph’s Cathedral. Their first meeting was in Brisbane when then Fr Heenan was parish priest of Zillmere. At that stage, Bishop-elect McCarthy was a deacon and seeking permission to visit a nursing home in the parish. Eventually they both worked together on the Commission for the Continuing Education of Priests. 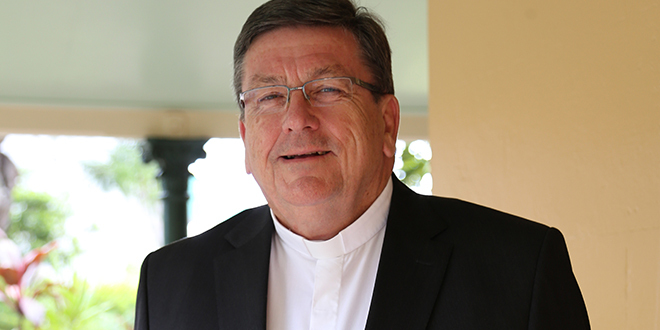 “When I was rector of the provincial seminary I also visited seminarians living in various parts of Rockhampton diocese,” Bishop-elect McCarthy said. Bishop Emeritus Heenan said the bishop-elect “brings many gifts and wide experience in leadership in the various roles he has filled”. “He is a pastor, whom I believe will be a good shepherd to the people of the vast Diocese of Rockhampton,” he said. Between 2009 and 2013, Bishop-elect McCarthy was Dean of Brisbane Northern Rivers Deanery and parish priest of Holy Cross Parish, Redcliffe. Prior to this, he was rector of Holy Spirit Provincial Seminary, Brisbane. Until now, he has been the episcopal vicar for clergy of the Archdiocese of Brisbane and parish priest of Hendra and Northgate. His first priority on taking up his appointment will be to start visiting and getting to know the diocese’s different parishes. “Many farmers are in the grip of a drought … I’m very much looking forward to visiting them as I come from a farming background,” he said. Mining is another key industry in Rockhampton diocese and Bishop-elect McCarthy knows a thing or two about that as well. In the 1970s, he worked for BHP Newcastle as an industrial chemist. His goals for Rockhampton diocese are clear. “I hope to be a good pastor and good shepherd, working alongside the diocese’s fine priests, religious and people,” he said.